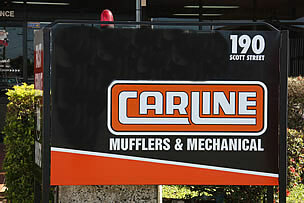 Carline Mufflers and Mechanical - Cairns is the one stop shop for your vehicles needs. They have 10 hoists that will hold a capacity of up to 6 tonne, which means that your vehicle will be taken care of in the most efficient time frame. They have been operating locally for over 20 years and have the equipment and knowledge to repair or enhance your vehicle. Whether it is your family car or your pride and joy of your garage, Cairns Mufflers and Mechanical will show it the upmost respect and do only first class workmanship. There is an air-conditioned customer lounge with tea and coffee while you wait. Also offering a courtesy drop off and pick up if required to your home, shopping Centre or to work. Dominic’s motto of giving the customer excellent service and quality workmanship stands are as strong as today as it was the business doors opened. The customer is always kept up to date with the progress of their vehicle, from start to finish. 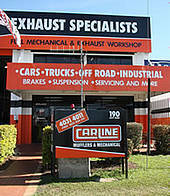 Carline Mufflers and Mechanical – Cairns can also dispatch parts to out of town customers with easy, with credit card facilities available over the phone. The team pride themselves in their workmanship and to getting the job done right!